Facebook is testing a feature in its flagship mobile applications that divides its News Feed into categories including travel, style and headlines. Facebook has also tested something similar for desktop News Feed in the past, allowing people to scroll feeds sorted by topics such as animals & pets, sports, food and travel. Facebook is adding customizable interest-based feeds. A newspaper made up of all the world’s newspapers. The Verge shared Stein’s tweet, adding that users can still access the standard News Feed, and the secondary feeds “borrow heavily” from Facebook’s stand-alone Paper app. People have told us they’d like new options to see and have conversations about more stories on Facebook around specific topics they’re interested in, so we are testing feeds for people to view different stories from people and pages based on topic areas. 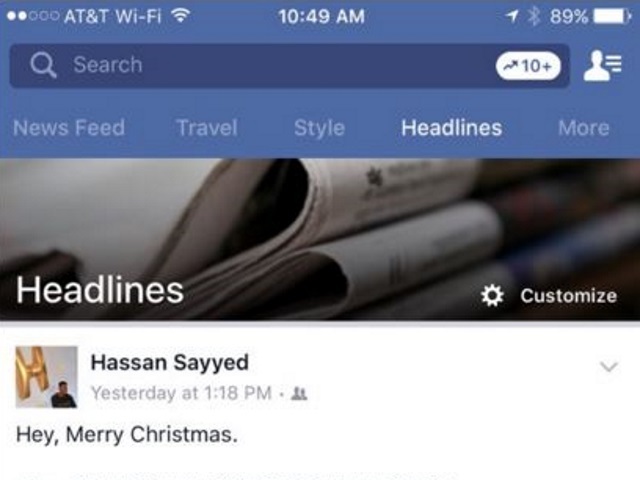 Readers: Would you like to see Facebook roll out these secondary feeds?